I believe that those Christians who spend their time and strength in intercession are doing a more valuable work than those who are too busy doing "great things" for God to take the time to intercede. This "knee work" lays the proper foundation for a life of obedience with results given by God. 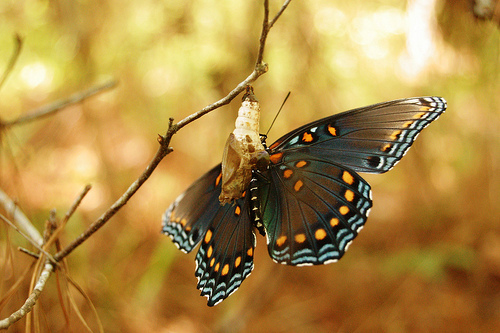 Without the struggle to leave its cocoon, the butterfly would never have the strength to fly in life. Some Christians spend their lives busy for God and then near the end of their days they finally take the time to intercede. Great indeed is the young person who forsakes all youthful busyness in order to bear the yoke of intercession in their youth. His/her life is marked and blessed eternally due to interceding before God. And they bear fruit early which other gifted young people never see in a lifetime. Young person, let me beg of you, please carve out time and learn to spend much time with God in prayer. Thank you so much for your gracious words. We love you all very much and of course affectionately pray for you all. Please continue to hold us up before God in prayer. We want God to hold our feet to the fire, keep us from falling, and help us to always practice what we preach.